Mario Torralba defended his PhD thesis on agroforestry in the Department of Geosciences and Natural Resource Management of the University of Copenhagen (Denmark). This thesis was carried out under the AGFORWARD project. The title is “Analysis of ecosystem service supply, trade-offs and social-ecological interactions in European wood-pastures”. This thesis explores and analyzes the mechanisms and processes driving ecosystem service supply in European wood-pastures. In the first part of the thesis, the scientific literature was systematically reviewed to assess how the ecosystem service framework has been applied to European agroforestry systems and to identify the outcomes of these assessments. 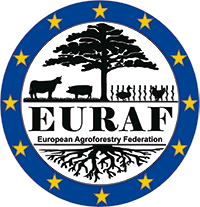 The results were used to identify the generality of existing case-study findings and the presence of large scale patterns; to detect methodological, theoretical and knowledge gaps, and to provide insights into future research on European agroforestry. In the second part of the thesis, the focus was on a specific wood-pasture dominated landscape in the Southwest of Spain, where diverse biophysical and sociocultural approaches were employed to assess ecosystem service supply and demand at the farm and landscape scales. First, through semi-structured interviews with wood-pasture owners and managers, the relationship between ecosystem service provision and wood-pasture management was explored, which identified trade-offs and bundles of ecosystem services. Special emphasis was put on the influence of farm size, land tenure, vegetation structure diversity and wood-pasture accessibility policy on landowners’ management decisions. Then, a public participation GIS approach was used to map the spatial distribution, patterns and intensities of ecosystem services perception by local inhabitants. These were used to explore the differences between different groups of inhabitants, as well as to identify the linkages between how landscape is used and perceived, and the influence of the former on subjective well-being. In the last part of the thesis, all previous work was integrated into a cross-site social-ecological analysis of ecosystem services supply and trade-offs in four distinctive oak-based wood-pasture dominated landscapes (Östergötland in Sweden, Southern Transylvania in Romania, Llanos de Trujillo in Spain and La Serena in Spain). A differentiated pattern of ecosystem service supply was found in the four study areas, which is governed by four main wood-pasture management dimensions that generate trade-offs of ecosystem services. It was further demonstrated that decisions concerning these management dimensions are determined by complex interactions between the properties of the social-ecological system, which have a direct influence on managers’ perspectives and motivations.